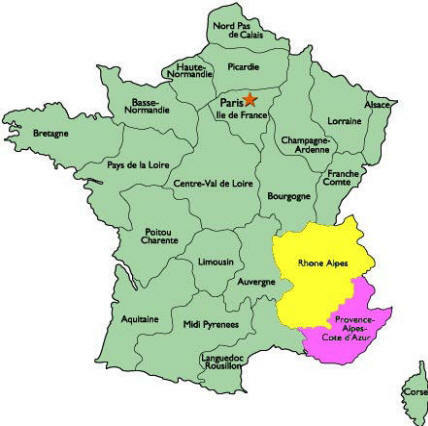 As you can see from the map below, by arriving in Grenoble, we have finally left Provence (pink) and are now in the region known as Rhône-Alpes (yellow). 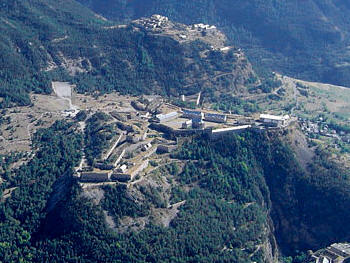 Grenoble (pop 165,000) is known as the ancient Dauphiné capital. In the Middle Ages, the counts of Albon took over a large area of land from the Rhône River to the Savoy region. 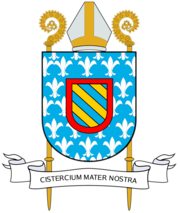 The Count Guigues IV of Vienne was given the name Dauphiné (dolphin) because of the dolphin on his coat of arms (right). The name stuck and was used by all the subsequent Counts. 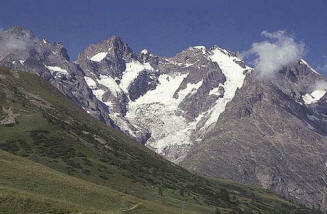 By the 13th Century, the whole region became known as the Dauphiné. 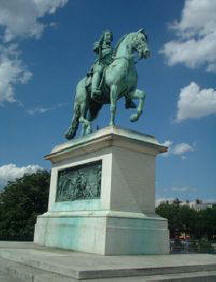 The French King Philip VI was able to buy the area in 1349 on the condition that he give the title to his oldest son. From that time on, the eldest son of a French king has been known as the "dauphine." The dolphin is also on a flag of Provence (lower right). I Woke up 10:10 and got up noticing that the rain had stopped and it was a beautiful sunny day. I couldn't wait to get out and get my run over with and explore this city. 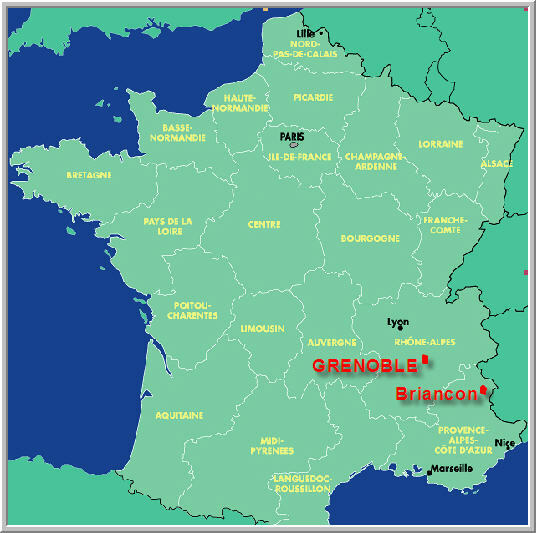 Grenoble is a thriving city and home to the science-oriented University of Grenoble and a center of chemical and electronics industries and nuclear research. 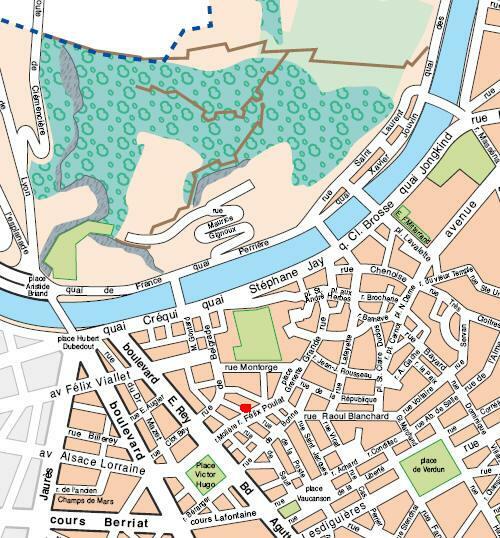 I looked at the city maps (above) and decided it might be nice to explore the central old part of the city. Our hotel is the red rectangle (above.) By 12:10 I headed out from the hotel (below) into the main square and did my run through the streets. The above square is called place Fèlix Poulat and going northeast it becomes the Grand Rue and the pedestrian area called place Grenette, lined with sidewalk cafés. Looking in the other direction you see the St-Louis Church. I took a peek inside before I started to run. When I was done running I explored many sites. I came across this church which was quite interesting and worth a photo. I couldn't get back far enough to get it in one shot so this (below left) is the result of using four photos and stitching them together. This is a very busy and cosmopolitan city. The trams were very modern and efficient. To give you a feel of the place, here are some scenes of the city from various areas. As I wended my way through some of the larger shopping plazas and then the smaller streets, I finally came to this large opening which I knew had to be the heart of the medieval town. It was place St-André, the prettiest square in Grenoble. It was not very busy when I was there, so the people don't seem to hang out here. It is very impressive, however, with the gray 16th Century Palais de Justice on one side. This building used to be the Parlement du Dauphiné. The umbrellas are from the Café de la Table Ronde which is the second oldest in all of France. Note the tiles on the roof of the Parlement du Dauphiné: historic story later. In the photo below you can see the 13th Century Collégiale St-André church which is rather drab on the inside as well as the outside. The theater is located in the yellow building on the corner (right) on rue Hector Berlioz. The Musée Stendahl is nearby in place de Gordes which leads to the large park called Jardins de Ville (left.) Later I got the chance to go through the park. 6) Le Cargo (Maison de la Culture): 4 rue Paul Claudel +33-(0)4-3849-9595. Below right is the top of St-André, missing from the photo above. Below right, in the center of place St-André, is the statue of Pierre Terrail, seigneur de Bayard (1473– April 30, 1524) who was a French soldier, generally known as the Chevalier de Bayard. Throughout the centuries, since his death, he has been known as the "Knight without fear and without fault, beyond reproach," or "le chevalier sans peur et sans reproche." He himself however, preferred the name given him by his contemporaries for his gaiety and kindness, "le bon chevalier," or the "Good Knight." When war broke out between Francis I and Charles V, Holy Roman Emperor, Bayard, with 1000 men, held Mézières, which had been declared impossible, against an army of 35,000, and after six weeks forced the imperial generals to retreat. This stubborn resistance saved central France from invasion. As a soldier, Bayard was considered the epitome of chivalry and one of the most skillful commanders of the age. 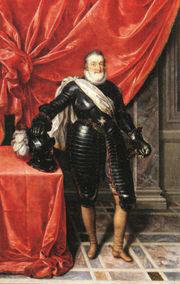 After he was killed in a later battle in Italy, his body was buried in Grenoble. France could use men like him. Not far from there I made it to the metallic grey-green waters of the river Isère to take some photos of the mountain on the other side which holds the Bastille. Looking east, you can see the beauty of the river and the Massif de la Chartreuse mountain in the distance to the north. 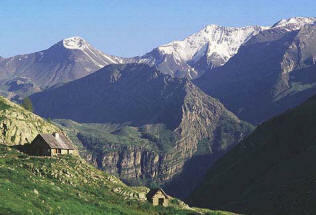 It was in these mountains that the Carthusian monastic order was born and Chartreuse liqueur was invented. Looking in the other direction, I saw the Téléphérique which goes from its station (gare) here at river's edge all the way up to the Bastille at the top of the mountain on the other side. As you can see, it is a set of five little glass balls dangling on a metal wire. As I watched them go up and down, I contemplated whether I would be willing to get on this thing and if I did, would Marcia go with me. It just gave me the chills, but I decided to think about it. From the river's edge, I wended my way west along the quai Créqui and then turned south down blvd Edouard Rey which turned east into blvd Jean Pain (below left.) This large building was interesting but I never found out what it was. It was getting pretty industrial and the road was under construction so I turned and headed back. I came across these two memorials; to the Blue Devils (Diables Bleus) on the left and to French soldiers on the right. Nearby, I came across a park called Parc Paul Mistral (remember him?) and then in place Paul Mistral I saw the Vasque Olympique (Olympic Flame) with the tall tower, the Tour Perret off in the distance. This cauldron monument celebrates the 10th Winter Olympic Games that were held here in February 1968, over 37 years ago. This is the Olympics that Jean-Claude Killy won three gold medals in skiing. I wandered back toward the hotel on rue de Strasbourg and at 1:40, I finally gave up and found a place to have a cappuccino. The Café Stendhal [11 rue Beyle-Stendhal, +33-(0)4-76-43-0776] looked like a good possibility. I forgot my "no chocolate" request and of course it came loaded with it. I wiped it off, sprinkled it with cinnamon and it wound up being fairly OK. It was nice to relax and just people watch for a while. Marcia called and told me we should get going if we plan to see anything. We had decided to stay here for two nights so we could rest and take a side trip. As I walked back to the hotel I noticed this interesting cheese shop and this statue in front of St-Joseph Church. Across from St-Joseph is a pretty square called place de Metz with a wonderful fountain. I arrived back at the Ibis and we got the car out of the garage and at 4:00 I drove the 72 miles heading to the mountain top town of Briançon [Bree-ahn-sohn]. We were recommended to go there by the very nice couple we met in Fréjus (Serge and Sabine Guerchon who live in Nice.) They told us we should not miss it. As you can see from the map (below left; Grenoble yellow in upper left) we were heading southest into the heights of the French Alps and would be very close to the Italian border at Montgenèvre, a ski resort. The roads take us through the Parc National de Écrins, the largest National Park in France. 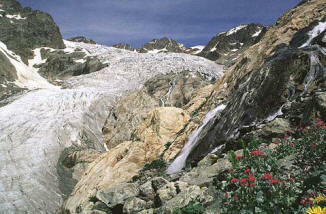 Here are some stock photos of the Park; note the glacier on the left. The roads were extremely windy and tortuous but the scenery was fantastic. These are the shots I got while driving the car, which was a trick. The photo of the waterfall (above right) was a snapshot taken from the video tape which was bouncing around a little. The roads often went through many tunnels as you can see the tiny hole on the left of this shot. We finally came across this very large reservoir formed by a huge dam with a power generator down below to the right. We stopped to enjoy the view and the fresh air. ...As I was saying, you can see Marcia (above) is crossing the bridge about to enter the Porte de Pignerol. Up on the hill you can see the Fort du Château. The spiked gate (below) was suspended over your head as you walked through. The Porte took us to the main street, the Grand'Rue which led directly downhill with a little stream running down the center of the street. The street is also called Grand Gargouille because of the stream. There is a parallel street called the Petit Gargouille because it also has a stream. The city boasts 300 sunny days in the year and this was one of them. The shops and little cafés jutting in to the street were very charming and inviting and being so close to Italy, they had a very Italian feel about them. Walking down you knew you would be dreading the long walk back up. There were also several art galleries (below left). I turned a corner and caught this glimpse of Fort du Château on the hill, then zoomed in to see what the sculpture was sticking up so prominently. Pretty good zoom on the Canon, huh? 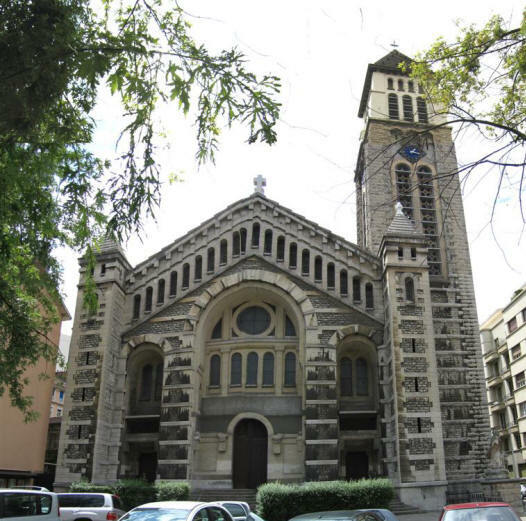 We wended our way back up to the church, the Eglise or Collègiale de Notre-Dame which was built in 1718, also by Vauban. 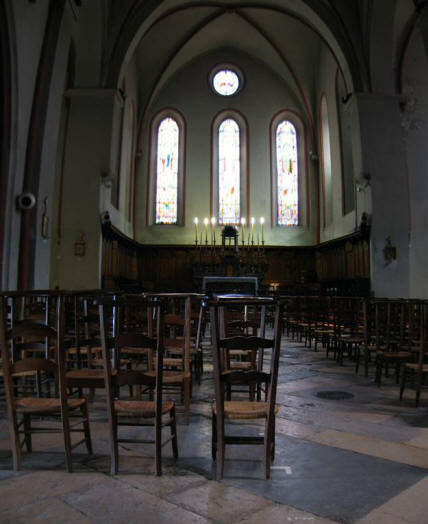 Below right is the interior of the church. 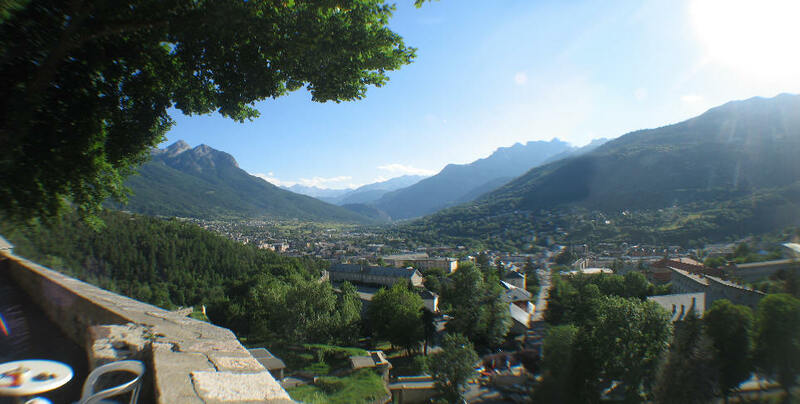 The scene below, over the edge of the wall, is the junction of five valleys which made lower Briançon (in the distance) an important strategic site in Ligurian and Roman times. The sun was setting in the west making the photos not the best. Below is a closer shot of the town below. It was breathtaking. Just before exiting the last of the high mountains we came across this memorial to the Resistance fighters, many of whom were killed by the Nazis here in these hills in 1944. 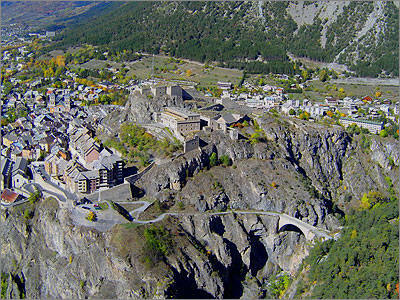 It is called Mémorial du Maquis de l'Oisans. Star Trek fans will recognize the name Maquis. We decided to pull over, take a look, pay our respects and take some pictures. At 9:40 we finally arrived back in Grenoble and immediately headed out looking for a place to eat before they were all closed. After walking around for ten minutes we settled on Les Archers [2 rue Doctor Bailly, +33-(0)4-76-46-2776] which was only one block from the Ibis Hotel in an open courtyard. A very lovely setting on a lovely warm night. In the photo below right, you can see Marcia with her blue jacket just above the wine bucket in the lower left. This was really beginning to feel French at its best. Marcia had a half-liter flask of house Alsace wine and I had a couple pression ("on tap") Heinekens. We shared our favorite Badoit water and she started with a house salade. We each had a roast half a chicken (poulet roti), something we were really hungering for. They were pretty good and very satisfying. We both shared the accompanying pommes frites (fries) and creamed spinach with tasty croutons. All of it was very good. For dessert we went crazy and Marcia had raspberries with whipped cream and I had a "floating islands" which were a little over the top with the butterfly flags. I saved them to bring home for Kaylin and Anabella. We relaxed after dinner and enjoyed the ambience of the place very much. At 11:45 we walked the short block back to the Ibis. Marcia went upstairs while I had an espresso and did some panorama photo-stitching in the lobby. I finally went upstairs and got to bed at 2:30 AM. A wonderful travel day.